The Galil is a different sort of sniper rifle. 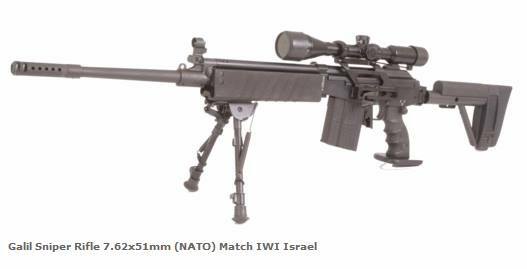 The Isreal defense department took the standard Galil assualt rifle, rechambered it to 7.62x51mm NATO, added a slick little adjustable stock that folds for transport, mounted the bipod to the front of the receiver (as opposed to the barrel), added a two stage trigger and mounted a scope on the side of the receiver to avoid mounting to the stamped receiver on top the rifle. These rifles are vary rare and were made for military only and as such we have not had the opportunity to use this rifle, so we do not have any concrete opinions. Our first impression are that the rifle will perform like an accurized assault rifle, and not like a true sniper rifle and reports on the original Galil supported this assumption. The rifle does incorporate some nice features, but it seems like the rifle was designed more as an early form of a Designated Marksman (DM) rifle and to extend the range of the standard infantry unit, much like the Russian SVD was. IWI has since introduced an updated version of the Galil sniper rifle, but details are hard to come by but reports are that it has much improved accuracy, but with the adoption of the M24 SWS as their primary sniper rifle, the new Galil sniper rifle will probably see limited use and will continue to be a rare rifle.